Learn more about the Lorex HD NVR with Super HD 4MP Security Cameras. Find pricing, and answers to common questions. The Lorex HD NVR with Super HD 4MP Security Cameras comes with six 8MP Ultra HD cameras. This Lorex business security system does not need professional installation. Includes 6 bullet IP cameras. Pros: Sends motion-activated push notifications to smart devices. RapidRecap summarizes hours' of activity into a short video. Cons: Can be expensive for smaller businesses. Bottomline: Innovative, feature-rich solution monitors your property in all weather. What are some alternatives to the Lorex HD NVR with Super HD 4MP Security Cameras? 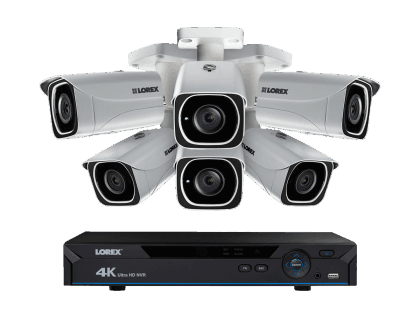 Where can I buy the Lorex HD NVR with Super HD 4MP Security Cameras? The Lorex HD NVR with Super HD 4MP Security Cameras is available via Amazon and the Lorex website. Does the Lorex HD NVR with Super HD 4MP Security Cameras work at night? Yes. This security system's infrared (IR) LEDs protect your property throughout the night. It clearly sees up to 130 ft. in ambient lighting, and up to 90 ft. in total darkness. Its integrated IR cut filter ensures accurate color reproduction during the day and crisp black-and-white video at night. Can the Lorex HD NVR with Super HD 4MP Security Cameras be used in any weather? Yes. The Lorex HD NVR with Super HD 4MP Security Cameras is weatherproof. Its IP66-rated cameras are resistant to inclement weather due to their metal housing. This security system can operate in temperatures ranging from -22 °F to 140 °F.